Is it possible to feel sympathy for a devil? 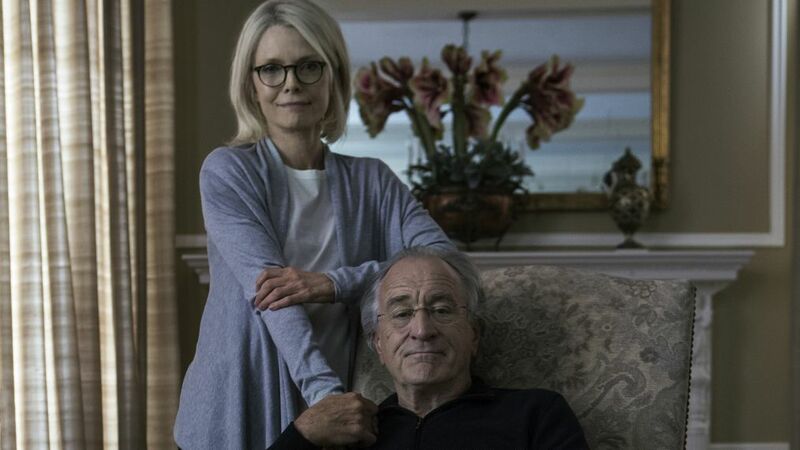 Robert De Niro and Michelle Pfeiffer play Bernie and Ruth Madoff in HBO's film about how the scandal wrecked their infamous family. Knowing the ending doesn't lessen the emotional suspense as Lies flashes back to happier times for the family, always clouded by Bernie's mysterious refusal to let his family into his inner sanctum or share his secrets. The bully beneath the bluff businessman is never far from the surface, and as his house of cards collapses amid the financial recession of 2008, his desperate hustling to keep his multi-billion-dollar Ponzi scheme afloat manifests itself in explosions of prickly rage. Michelle Pfeiffer, who like De Niro is making her HBO debut, is a study in addled frustration and misery as wife Ruth, lamenting, "How did I get to be this age without doing anything on my own?" Alessandro Nivola and Nathan Darrow are heart-breaking as sons Mark and Andy, whose feelings of betrayal are further soured by their overwhelming shame in a new media-fishbowl existence. Will the film shape viewers' opinion of Madoff and his crimes? Even they know their suffering pales next to the many lives ruined by Bernie’s historic fraud, but this stark account of a family’s downfall has the wrenching power of an Arthur Miller classic.